India successfully test fired ‘Nirbhay’, the 1,000 km strike range sub-sonic cruise missile, off the coast of Odisha on Monday. 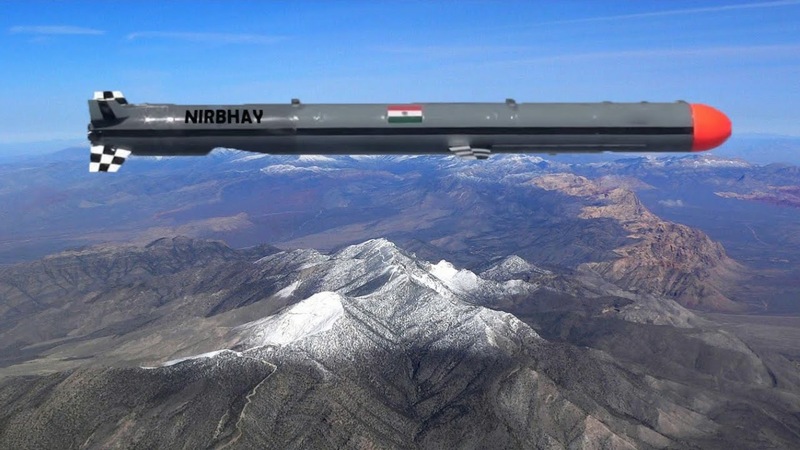 India again shown its true defense capabilities today on April 15, 2019 after successfully test-fired its first indigenous built, designed and developed long range sub-sonic cruise missile ‘Nirbhay’, which has 1,000 km operational range and a capacity to accommodate warheads of up to 300 kilograms. It was successfully test fired from the Integrated Test Range (ITR) at Chandipur along the Odisha coast. This was the fifth experimental test of the homegrown missile system. Out of the four earlier trials since its maiden launch in 2013, only one was successful till now. Describing the trial a success, a defense statement said the Defence Research and Development Organisation (DRDO) achieved yet another feat, the successful test flight of ‘Nirbhay’ which can be deployed from multiple platforms. Today’s flight test achieved all the mission objectives completely, from lift-off till the final splash, boosting the confidence of all scientists associated with the trial, the statement said. Defence Minister Nirmala Sitharaman on this occasion complimented DRDO scientists for this inspired achievement. She was optimistic that this would take India to the select league of nations possessing this complex technology and sub-sonic cruise missile capability, it said. Chairman of DRDO and Secretary Department of Defence (R&D) Dr S Christopher, DG (Aero) Dr C P Ramanarayanan, along with other senior DRDO scientists and user representatives from the Army witnessed the launch and congratulated the ‘Nirbhay’ team for making the DRDO proud. The state-of-the-art slim and stylish cruise missile took off from a specially designed launch pad from the launch complex-3 of the Integrated Test Range (ITR) at Chandipur near Balasore. The missile has the capability to loiter and cruise at 0.7 Mach, at altitude as low as 100 m.
It took-off in a programmed manner and all critical operations like launch phase, booster deployment, engine start, wing deployment and other operational parameters demonstrated through autonomous way point navigation, the statement said. The guidance, control and navigation system of the missile is configured around the indigenous designed Ring Laser Gyroscope (RLG) and MEMS based Inertial Navigation System (INS) along with GPS system, it said. The missile cruised for 50 minutes, achieving the range of 647 km. It was tracked with the help of ground-based radars and other parameters were monitored by indigenous telemetry stations developed by the DRDO, the statement said. According to a DRDO scientist associated with the project, powered by a solid rocket motor booster developed by the Advanced Systems Laboratory (ASL), the ‘Nirbhay’ missile has an operational range of 1,000 km. It can travel with a turbofan or turbojet engine and is guided by a highly advanced inertial navigation system indigenous developed by the Research Centre Imarat (RCI), he said. After the missile achieves designated altitude and velocity, the booster motor is separated and the engine automatically switches on for further propulsion, the scientist said. The health parameters of the vehicle were monitored at indigenous telemetry stations by a team of professionals from DRDO’s ITR and LRDE (Electronics and Radar Development Establishment). The two-stage missile is six metre long, 0.52 metre wide with a wing span of 2.7 metre. It can carry a warhead of 200 kg to 300 kg at a speed of 0.6 to 0.7 Mach. Its launch weight is about 1,500 kg, DRDO sources said. The Ministry of Defense (MoD) has considered axing the Nirbhay program on multiple occasions over the past years for numerous reasons including technical issues with the weapon system, funding difficulties, and questions over the operational need for a subsonic, long-range cruise missile given the existence of the more reliable but shorter ranged BrahMos supersonic cruise missile.